Generally, we associate the summer with good health. It’s easier to exercise, the sun feels good on our skin and we’re more inclined to get out to enjoy a fresh air adventure. The same applies to our horses and we love sharing our passion with them. Sadly, the summer also brings along equine health issues, one of them being headshaking. It may sound innocuous but headshaking among horses can be a serious and upsetting occurrence. Summertime in the UK can often see a rise in the number of headshakers; a distressing condition for both owners and their horse, so we spoke to our horse health expert to find out more. A: Headshaking is a general term for a condition which causes sudden, involuntary and violent flicks of the head; up and down. It is often associated with sudden snorts, rubbing of the face and nose, abnormal head carriage and occasionally ridden problems. The severity of the symptoms can vary, from mild irritation to a much more severe, acute shaking of the head. 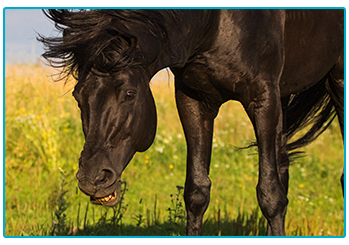 This acute shaking can result in the horse becoming uncontrollable. A: Headshaking behaviours can result from dental discomfort, poor fitting tack, eye problems, orthopaedic pain, allergic rhinitis and sinus problems. Headshaking has also been associated with facial pain caused by facial hypersensitivity. Research indicates that damage to the main sensory facial nerve (trigeminal nerve) may cause sensory stimuli to result in an excessive sensory response within the trigeminal nerve. This continued persistent sensory stimulation may be perceived as pain (trigeminal neuralgia). Q: What can I do to prevent headshaking? In some horses, the condition may be linked to the time of the year, with some only displaying signs during spring and summer. These cases may be related to triggers such as flies, pollens, dust and heat. Treatment and prevention includes the identification of the underlying cause, such as a previously undiagnosed allergy. 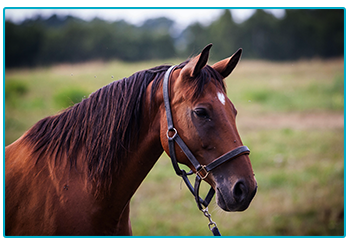 Your vet may also look into the use of fly masks or veils and nose nets, any recent medical treatment, potential environmental trigger factors such as riding indoors and surgery on the trigeminal nerve. 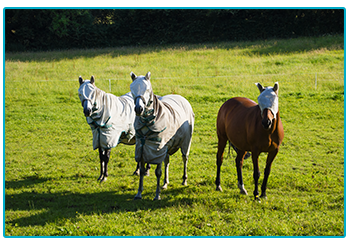 As with many horse health issues, often the best precaution is to make sure your horse is cared for and looked after. Consider all of its needs, from lodging to food, hydration, exercise and surroundings. Specialists are looking into further treatments such as percutaneous electrical nerve stimulation, which is being used to treat trigeminal neuralgia. If you think your horse may be headshaking but you are unsure, you shouldn’t take any risks, contact your vet immediately.